Home/performance past/“Singin’ in the Rain” is a show for everyone! It’s just fun! The dog days of summer are upon us. It’s hot. It’s steamy. It’s unbearable. 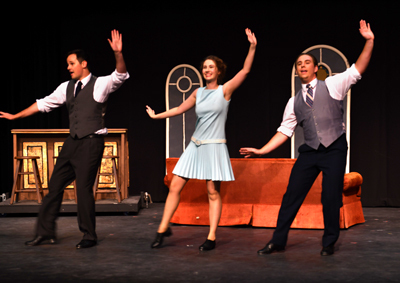 SAAC has the answer with its summer musical, “Singin’ in the Rain”! Come get some summer relief and be totally entertained by a cast of incredibly talented singers, dancers and actors who will tap dance their way into your heart. Filled with every memorable moment from the film and a downpour of unforgettable songs, “Singin’ in the Rain” is one of the best loved musicals of all time. The fun-for-all-ages show pours down delight, capturing the waning days of the silent-screen era as they give way to new-fangled “talkies.” “Singin’ in the Rain” includes some of the best-loved comedy routines, dance numbers, and love songs ever written, including “Good Mornin’”, “Make ‘em Laugh,” and—of course—the show-stopping dance number “Singin’ in the Rain.” Prepare to be astounded by a real, onstage rain storm! “It is very cool how this season at SAAC has tied together so well, with ‘Sunset Boulevard’ and ‘Singin’ in the Rain’ both being about the advent of “talkies,” said lead actor Alex Jeffery, who also brought his professional filmmaking skills to SAAC, filming a silent movie called “The Dueling Cavaliers” to be shown in this production. The ensemble cast has been busy working on the songs and tap dance moves that are the highlight of this show. 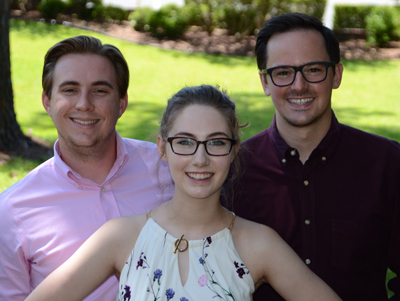 The actors playing the three main characters, Jeffery, who plays Don Lockwood; Brandon Wallace, who plays Cosmo Brown; and Laura Purvis, who plays Kathy Seldon; are tapping their toes nightly to learn something none of them had ever attempted before being cast in this show. According to Jeffery, it’s not been easy, but they all have loved learning a new skill to add to their resume. When not rehearsing on stage, the trio can be found practicing their tapping in the ballet room or working on songs together. “Singin’ in the Rain” is a show that focuses on singing and dancing, as well as acting, and they are all three very accomplished singers. Tying it all together with the dancing and acting is keeping them on their toes. They are all very excited about the dance number for ”Good Morning,” in which they actually have to tap dance onto a sofa and flip it over as they cross it. This dance has taken many hours to perfect and is a highlight of the film, as well as the musical. 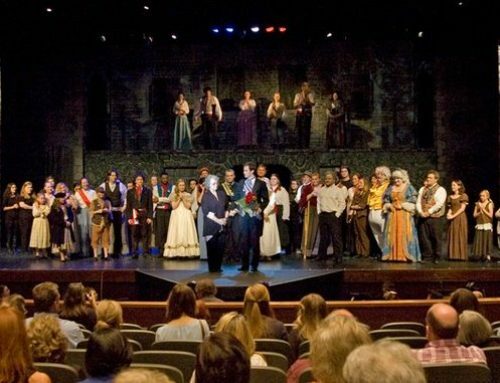 This classic Hollywood musical will run in the Callaway Theater on July 12-15 and 18-22.